Cardio exercises are a great way to keep your heart healthy and to keep your body fit. Performing a cardio exercise burns calories, help for weight loss, reduce stress and improves the sleeping. They also improve lung capacity and make the heart stronger. Any type of exercises that speed up the heart and lungs are cardio exercises and for rеаching of the cardio exercises benefit you should practice three to four times a week (about 20 to 30 minutes) at least. People very often complain that cardio exercises are boring and they quickly gave up on them. To stays committed to them modify the intensity and make various exercises continuously. For example, if you walk, walk few minutes with medium pace, the next few minutes speed up or start running. If you run, run a few minutes with a slow pace and then start sprinting for a minute. Some interesting cardio exercises that you can do at home are given below. This exercise will tighten your body and besides this will improve your mood. Each of the following cardio exercises should be done once for one minute and then the exercise can be done combined, depending on your choice. Stand up straight, put your feet on the shoulder-width apart, spread the hands and lift them over your head (your body should be in the form Y). Transfer the weight to the right leg, fold up the left knee and start to lift the left leg. Lift up your foot higher you can to touch it with your right hand without having to bend forward. Then jump on the left leg, lift your right leg and with your left hand touch your foot or ankle. Stand upright with your feet shoulder-width apart and put down your hands along the body. Jump and spread the legs and the arms together (X form). After jump returns the hands and feet in the first position. Start running hard upstairs, and then go downstairs slowly. Repeat this activity several times. you shouldn’t climb many stairs, only 10 to 15 stairs are enough. For the more intense workout, climb 2 stairs together (climb through one stair). Make fast little jumps and don’t jump high. If you don’t have rope, just imagine it in your hands and do the same motions. This exercise is an intense cardio activity and will help you stretch all body muscles from the shoulders, through the buttocks, up to the legs. 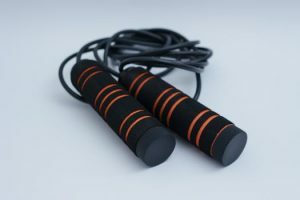 Performing jumping rope exercise for 30 minutes burns up to 300 calories, so with this exercise, you can get rid of excess weight easy and funny. Put a long thin object on the floor. It can be a short stick or long broom lever. Stand right from the object and put your hands on the hips, and then jump on the left site of the object. Then jump right and the next step in the opposite direction. Start to run in place, but instead pulling the feet just a little from the floor, lift your knees higher (up to the hips). Make this cardio exercise 1 minute. Then yon can make some other exercise and repeat this exercise again. Stand in position for pushups. Your hands should lay below your shoulders, legs must be straight and the weight should fall on the toes of the foot. Bend your right leg and bring it towards to your chest. Then change the position of your legs, bring the left leg forward to your chest and at the same time stretch your right legs back. Previous articleHow to get longer eyelashes?